Minnesota Timberwolves center Nikola Pekovic goes up for a shot against the Utah Jazz at Target Center. MINNEAPOLIS (AP) — The laughter spilled over from the Minnesota Timberwolves bench into the locker room long after the rout was finished, as a team that has been searching for some camaraderie and positivity basked in the blowout. The reeling Timberwolves needed a game like this in the worst way, and in stepped the Utah Jazz to tee it up for them. 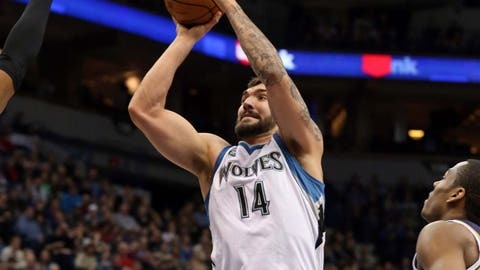 Nikola Pekovic had 27 points and 14 rebounds in three quarters, and the Timberwolves blasted the Jazz, 98-72 on Saturday night. Kevin Love had 18 points, 13 rebounds and five assists, and Kevin Martin scored 20 points to help the Wolves snap a three-game losing streak that included losses to Sacramento and Toronto. 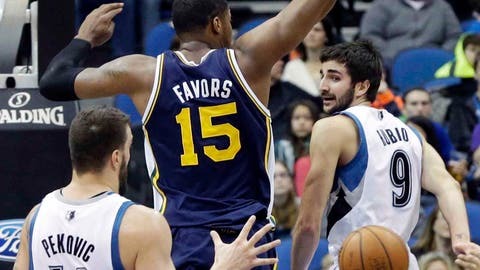 The Wolves scored 28 points off 16 Utah turnovers and outscored the Jazz 50-18 in the paint for a much-needed runaway. "It’s fun when we play like that and everybody communicates," said point guard Ricky Rubio, who had six points, nine assists and eight rebounds. "Right from the beginning we didn’t have any pep to us, we didn’t have any energy," Jazz coach Tyrone Corbin said. "We settled for jump shots and they were going to the basket. Give them credit, they were the aggressive team tonight." The Timberwolves fell a season-low three games under .500 with a dispiriting loss in Toronto on Friday night, and a season that started with playoff aspirations was threatening to be done in by a lack of team chemistry and an inability to win close games. They are 0-11 this season in games decided by four points or less, but also lead the league in games in which they’ve led by at least 30 points (10). Promising rookie Trey Burke had just nine points on 2-for-10 shooting for Utah, which was playing again without leading scorer Gordon Hayward (hip flexor). And they’ve never missed him more. Later in the half, Jeremy Evans missed three straight layups, and the exasperated Jazz just gave in. "It was horrible," Evans said. "I was telling myself, `There’s no way I’m going to miss these shots.’ There’s definitely a lid on this thing. That just explains the kind of a night we had." The Jazz made two field goals in the entirety of their nine-point second quarter and went into halftime trailing by 28 points. They went 8 for 39 in the first two quarters, just 20.5 percent, and managed a season-low 23 points, the second-lowest scoring half for a Wolves opponent in franchise history. The Timberwolves weren’t exactly on fire, either. They shot 44 percent in the first half and missed eight of 19 free throws. But if any team needed a gimme like this one, it was the Wolves. They had lost four of their previous five games to fall to 11th in the Western Conference and were fighting discord in the locker room and plummeting confidence on the court. That all changed on Saturday night, with Love and Pekovic rough-housing on the sideline, Martin playing with an aggression that hasn’t been seen for a few weeks and Rubio playing with a hop in his step and a smile on his face for the first time in a month. "We really needed it," Pekovic said. "We tried to push ourselves tonight. We were talking a lot about it. Energy, talking on defense. From the very first moment we stepped on the court I think we looked like we were ready to play." Notes: The Jazz’s previous franchise low for field goal percentage was 29.3 percent against New York on Nov. 14, 2005. . . . Love hit a 3-pointer in the first quarter that moved him past Wally Szczerbiak for second on the franchise’s career list. . . . The teams meet again in Utah on Tuesday.